I hope you are having a great week. I am slowly getting back to my blogging schedule. I have been rather busy since two months. During this time I really missed it here, discussing with you about products we love or hate. The topic might look like superficial in the end but I met all kinds of amazing people through this little blog during last years which makes all the effort worthwhile. First things first, for men, it has to be technological dude! 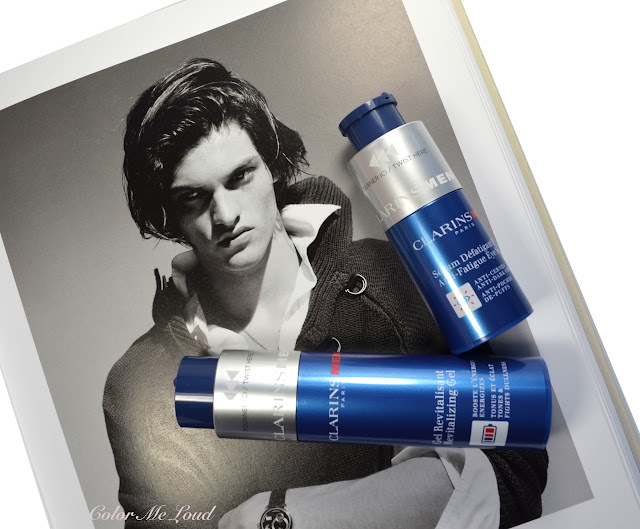 Clarins got this right. Being woman working in a technical field, I have to admit I am drawn to products which have interesting opening closure mechanism as well. Below I tried to give you an idea of how it works but let me tell you, it is not as complicated as it looks. One has to twist the silver ring in the direction of the arrows and voila, you have the pump out. No wait, it is not the pump which is coming out, it is the protection which goes down. Well made, looks like the skincare of the aliens living in a more technological planet, well made and fun! And of course the colors, blue and silver. Once hubby was out of moisturizer, I offered one with a pink packaging and he refused to put it on haha! What is that with men and color? I know men who would happily help you carry plastic bags around as long as they are not pink! Go figure. 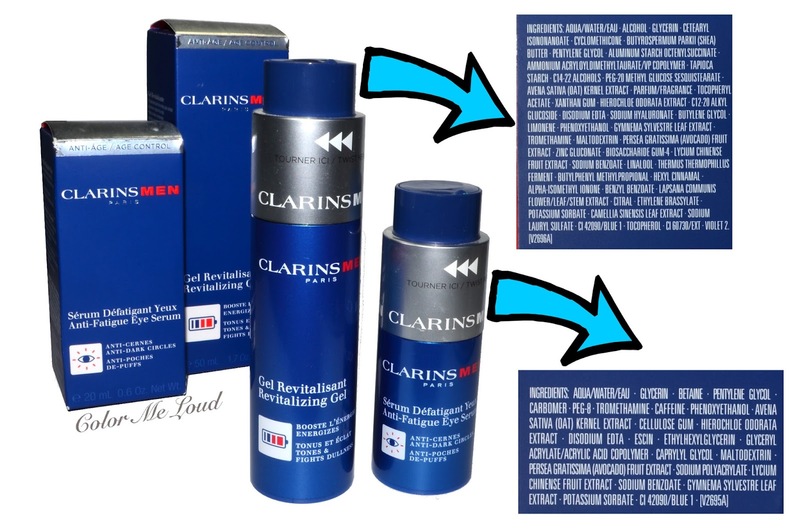 As for the product, Clarins got the most important thing right. It shouldn't sit on the skin, it should be absorbed, if possible instantly. After all no men would like to be seen wearing skin care. The gel texture of both of the products, Clarins Men Anti-Age Skin Care line, Revitalizing Gel and Clarins Men Anti-Fatigue Eye Serum make this possible. Out of curiosity I stole some of these and applied on me (after all I am the one who is typing the reviews!) and I was blown away by the fact that how fast it was absorbed. Of course this is achieved by some amount of alcohol in Revitalizing Gel so I include the ingredients list below for your reference. Revitalizing Gel has Shea Butter and Oat Kerne Extracts to get the man of your life a glowing skin while the others think it is his natural complexion. There is an application video of how-to apply the eye serum on Clarins Website. I wished I had seen it before because Thomas got a good amount in his eyes during the first trials. Men and eye serums, gosh, this is something which needs a little bit more time I guess. Anyway there is caffeine in there to get rid of puffiness it also aims at dark circles as a long time effect. These are always hard to test but it leaves a nicely hydrated eye area after the usage. Both of these products are very light weight in our terms and suitable for secret skin care admirers, ehm, men! 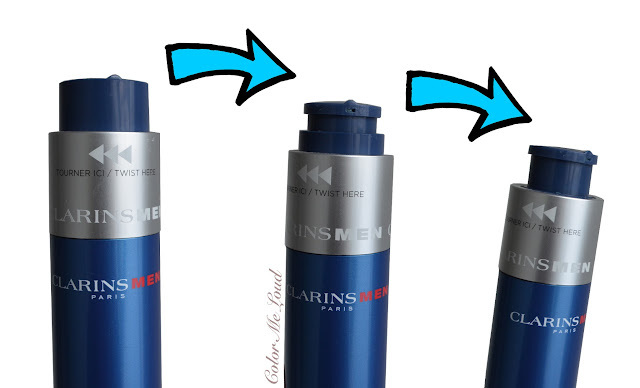 Final thoughts: Clarins Men Age Control Anti-Fatigue Eye Serum and Revitalizing Gel are both light weight, easily absorbed products with a nice nerdy touch to the packaging. From what I can tell, Thomas liked them both since the bottles are now empty! Does your hubby, father, brother use skin care? To what extend? Disclaimer: The products in this post were sent free of charge for my our consideration. My husband has to have the very most natural ingredients and the simplest products-- so artisan ale and forget anything else. My husband gets irritation from shaving every day, so I once bought him Neutrogena Razor Defense Post Shaving Lotion. He liked it and it seemed to help, but for some reason he stopped using it and that was that. His solution now is to alternate days shaving with a Braun electric razor and with shave cream and a hand razor and then taking one or two days off from shaving on the weekends. And when he gets chapped lips he will ask for lip balm and then behave all weird about actually having to put it on his lips. Clear lip balm! He does however like a bath/shower gel from L'Occitane which has been discontinued. For the record, he won't go anywhere near anything pink. I am also for polished men! As long as his manicure is not better than mine, he looks masculine enough for me :) His slow progress on anything grooming related is for me like seeing a child to grow and learn, sweet. When he told me recently that the shampoo I gave him is finished (Kerastase for men) and it was better than one he bought from a supermarket, I felt like awwwww, if you can tell the difference, there is still some hope :) And recently we negotiated a face wash with a natural mild face cleanser in the night and applying one treatment, which is also very light in texture, absorbs quickly and is loaded with anti-aging ingredients - Menscience Anti-aging Formula (I initially bought it for myself, like this brand). Well, the stuff he gets really is-- only organic oils and ingredients. The marketing phrase "natural" has no true meaning as there are no specific guidelines that define it. I too use organic skin care, foundation, and body care, but when it comes to makeup and nail polish, I lower my standards for healthy ingredients, she says, just having applied a yellow green Koh nail polish. LOL. What a lovely discussion:-) I had to grin at several comments. My husband does use a face cream, a facial cleaner and some good after shaving skin care. But forgets it to use it often. And than I remind him about how dry his forehead gets and than he tries not to forget. Its just not on top of his mind. He doesn't mind his wrinkles also. Sometimes I can tempt him to take a mask with me. That's cute. The face cream does make his skin less dry and much firmer though. Late coming to the party! Both my adult sons use Jack Black Protein Boosting Serum as a light-weight moisturizer (I do, too :-) ) and Jack Black Beard Oil (I don't use that one! LOL). They also both really, really like the Clarisonic Fit for men that they got for Christmas. They don't obsess about skin care, but they do take care of their skin. My husband is terrible at it. He'll complain to me about dry, itchy patches but he doesn't have the patience to be consistent. He expects to apply something once and have the problem solved. Dream on! Lol, it is good he can tell the difference on the shampoo level, it is not easy. I will check Manscience, looks like something I could enjoy! Once my father told me (and he is a chemical engineer) he wouldn't sleep in the same room with one of these nail polishes. You can guess how many of these I have in the bedroom right now hahaha! I don't keep them in the bedroom because you know, they do have phthalates and solvents in them.